We had a packed house at our weekly gaming group, with several tables of us regulars alongside some new faces. As always, there was a wide variety of games on the tabletops including Specter Ops, Descent: Journeys in the Dark, Sushi Go Party, FUSE, Kingsburg, Othello, and several others. My buddy Oscar brought Rhino Hero, which is one that has been on my gaming bucket list for quite some time. It’s a gamer’s version of building a house of cards. Each player starts with five cards and plays one of them. First, they add the wall cards on the spaces indicated on the roof (or if they’re first, on the base) card. 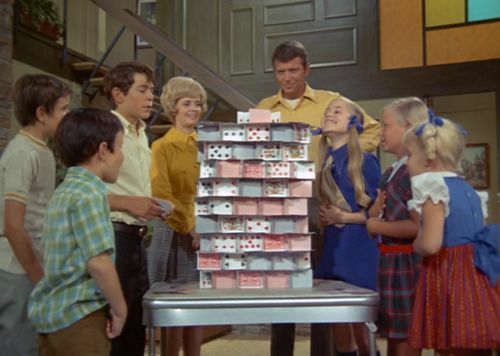 Next, they lay down a new roof card, which will indicate an action such as play another roof card, make the previous player go again, place the rhino figure on the card, and more. First player to play all of their cards wins or whoever has the fewest cards when the building comes crashing down is victorious. It was nerve-wracking trying to place the cards on top of each other and the Rhino Hero meeple seemed like it would bring down the structure every time we moved it. I think we made it to seven stories before our building bit the dust. I’m sure this will be a hit at my family game nights, so I’ve added it to my Wish List. All hail Rhino Hero!